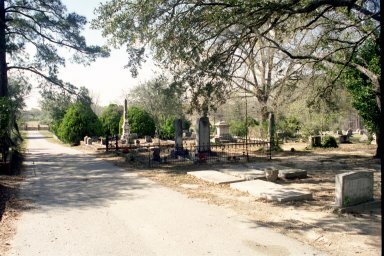 This cemetery is located just outside Allendale, South Carolina at the original site of the Swallow Savannah Methodist Church (now in town). It is a lovely hill with large live oak trees. Cemetery transcriptions have not been published for this cemetery. Transcriptions of a few graves are included here as family members or possible family members. I wish I'd had time to do more. The notes in italics are my notes, based on census records provided by David Bryan. The camelia bloom on the grave was compliments of the nice lady from the Swallow Savannah Church who was kind enough to lead me to the cemetery and the family plot. This is Charles M. Hiers, Sr. who married Sarah E. (Sally) Raysor, daughter of Henry Chalmers Raysor and Sarah Wilson Raysor after the death of his first wife, Rebecca O. Raysor Hiers. 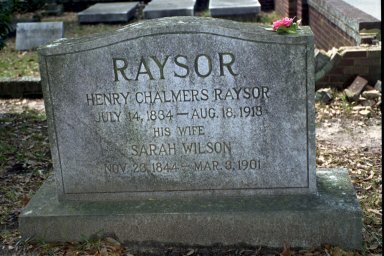 Rebecca Octavia Raysor, wife of Charles M. Hiers, Sr.